Authorities said the 19-year-old told them that she "settled" on drowning her 1-month-old son in a bathtub Wednesday "because she did not want to hear her son cry," according to the report. Authorities said the Arizona mother had searched the Internet on her cellphone using more than 100 different queries, such as "ways to die instantly." She had read about "how long it takes babies to drown," "five types of parents who kill," "reasons parents kill their babies" and read about cases involving missing children, according to a police report, which was obtained by AZFamily. Later, authorities said, Folwell drove to a park in Chandler, Arizona, where she called 911 and reported that her son had been kidnapped. However, during an investigation, police discovered the baby's lifeless body hidden in a duffel bag at Folwell's home. Folwell has been arrested and charged with first-degree murder in the death of her son, Rainer Canku-Folwell. Folwell is being held on a $1 million bond, according to online booking records. It's still unclear whether she has an attorney in the case. 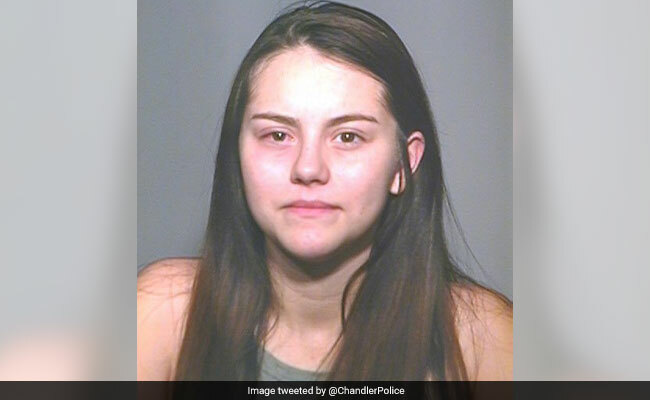 Chandler Police tweeted "Update to last night's death investigation: The mother of the deceased baby from yesterday afternoon's death investigation has been identified as 19yoa Jenna Folwell. Jenna was booked into the Maricopa County Jail overnight on one count of 1st Degree Murder." At Folwell's initial court appearance earlier this week, Rainer's father spoke about his son and the pain that Folwell has caused him. "Rainer was a perfect baby and had such a happy and peaceful demeanor," Rainer's father, 19-year-old Eric Canku, told the court. "I was able to have him spend the night a couple of times and he was perfect." Now, Canku said, he will never get to hold his son again. "I will never get to have any firsts with my son," the father told the court. "I won't be able to watch him walk and talk. I won't be able to watch him play catch or go fishing. I won't be able to even take him to school. She took away my life with Rainer the moment she took his life. She could have reached out to me and my family. We would have taken sole custody." "I want her to have a life without parole," he added. "She can live every day knowing what she did to that poor innocent child. The pain she has caused me has no definition." Authorities said Folwell's story evolved throughout the investigation. Authorities said that once police discovered her son's body and confronted her about the kidnapping claim, she told investigators that her son had drowned. According to the police report, Folwell told investigators that she had taken a bath with her son and that while they were in the bathtub, she passed out; then when she awoke, she told the police, her son was face down in the water. Police said Folwell told investigators that when she realized her son was unresponsive, she put his body in a duffel bag and reported it as a kidnapping. Then once police discovered her Internet search history and confronted her again, authorities said she "admitted to getting in the bathtub with her son and then letting go of him," the report stated. "Jenna said she settled on this way because she did not want to hear her son cry," it read. "Jenna said her son was in the tub for about a minute and then she regretted her decision and got him out of the bathtub and attempted CPR. Jenna said she then put her son in the duffel bag and then later drove to the park to report the kidnapping."